Eventually I tasted the most authentic Malaysian cuisine in Melbourne. Laksa king located at a hidden mall in Flemington which is hardly to be noticed, was surprisingly full house. We need to wait for about 10 minutes before seated, and there was still people coming in every few minutes. I was craving for Chendol but too bad the 'cendol' was running out and I finally had a Iced Red Bean ($3.80) and Fish Head noodles ($10.90) while Chris had a 'Har Mee' aka prawn noodles ($9.90). The food tasted fantastic, amazingly delicious and genuinely malaysian oriented. I must admit I'm not a chinese (those from china mainland) food fan and quite sick of their food and maybe their people too. Even malaysian restaurant didn't cook genuine malaysian cuisine to suit those ang mo's appetite. Anyway, Laksa King brought me to the food's heaven in Melbourne. Thumbs up! 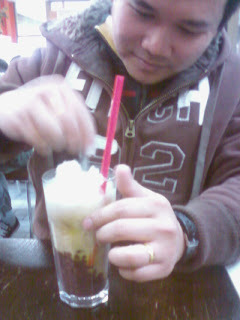 Service so so lar, like kopitiam in malaysia. 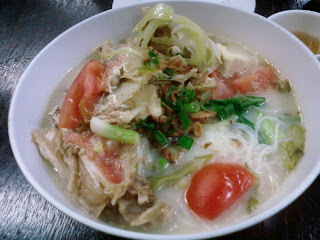 Actually it's fish head beehoon. I will try laksa next time. 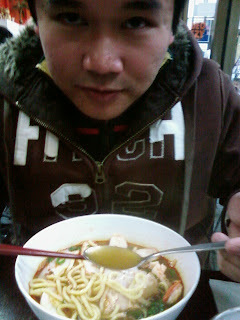 Tell sy's next door uncle i missed his laksa and cha sao oil noodles. Yum!! Someone in the middle somewhere on earth. Someone who is searching for her goal of life. someone's daughter & someone's wife. Who moved my Tim Tam?